DOHA, Qatar — A decade ago Sheraton’s pyramid shaped hotel was just about the only modern building along this city’s Arabian (Persian) Gulf shoreline. Today the hotel is dwarfed by 21st-century skyscrapers designed by architects who seem to have been inspired by the shapes contained in a boy’s toybox. Yet along with the playful shapes comes an accompanying narrative of the rising concern about how development affects the Gulf’s ecological and economic security. We are learning quite alot about the damaged ecology of the Gulf. Referred to as “Arabian” here, not “Persian,” as its known in the West, the Gulf is quite a sizable sea. But it is bottled up by the Strait of Hormuz, which at its narrowest point is 20 miles from shore to shore. Water flow is so slow that scientists here refer to it as a big bathtub. That bathtub is stirred by the fierce turbulence of the region’s oil and gas industry, much of which operates offshore, and nearly all of which is served by constant ship traffic. In addition, the bathtub is getting saltier and warmer. There are three primary reasons. Increased evaporation is linked to higher temperatures and climate change. Gulf nations are slowing or diverting the flow of rivers that drain into the sea. And a rising tide of concentrated brine pours from the dozens of desalination plants that supply the region’s drinking water, and from the natural-gas fired power plants that supply their energy. Qatar’s desalination plants produce 1.5 million cubic meters of water daily, almost 600 million cubic meters annually. A third or more leaks from old pipes, which means about 1 million cubic meters daily actually is used by humans, which comprises 99 percent of the water that the country drinks and uses for industrial practices. But for every one gallon of fresh water produced in Qatar’s desalination plants, we are told, nine to ten gallons of warm and concentrated salt water is discharged back into the Gulf. Qatar’s production represents just five percent of the total amount of freshwater produced by desal plants in the Gulf, and five percent of the salty discharge. By my calculation, confirmed by researchers at the Qatar Environment and Energy Research Institute, our hosts here, roughly nine to ten billion cubic meters of desalted water are produced in the Gulf region annually, and 900 billion cubic meters of brine is released back into the sea each year. That’s a torrent. To give an idea of the amount, China uses 600 billion cubic meters of fresh water annually. Tomorrow we tour a desalination plant and will gain more understanding of the ecological risks to the only big body of water that Gulf countries can dip their drinking straws into. The Gulf shoreline, though,provides a handsome stage for an Arabian skyline. 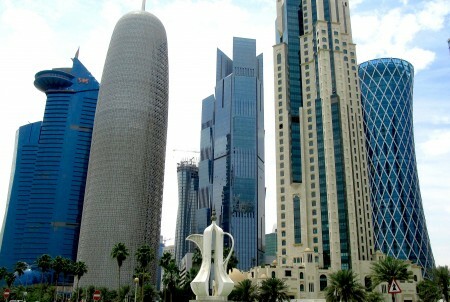 Doha’s glass and steel towers, the tallest of which tops 900 feet, come in an array of shapes. A sea cucumber, complete with an urchin-like spike at the summit, stands at the center of the collection. There are buildings with the broad shoulders of a toy soldier. Another is odd-shaped and turned at the stomach like Gumby. One more extends its belly. Another is sheathed in armor-like panels at its chest. There’s also a tower shaped like a crayon container with a narrow waist. By day the buildings mirror the colors of the coastline — a marine blue like the gulf and soothing brown like the sand. At night they sparkle in white and are edged in slashes of blue and red. A new development, the Dubai Towers, is under construction and will be 84 stories and 1,401-feet tall when it’s completed and opened next year. New York mastered the modern skyline of the 20th century. The skylines of the 21st century are being mastered in the growing cities of Arabian Gulf and the Pacific Coast of Asia, places like Manila, Shanghai, and Hong Kong. 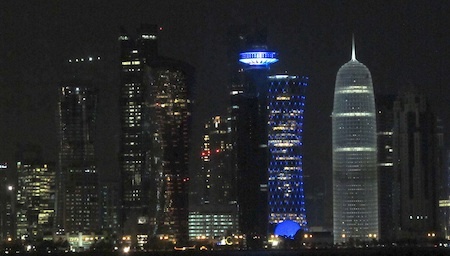 Doha’s skyline honors the ambition of this small nation, the daring of its urban designers, and the beauty and threatened safety of the sea that dwells alongside.